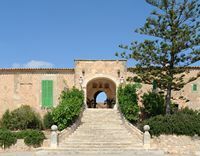 The Shrine of Our Lady of Mount Sion (Santuari de la Mare de Déu de Monti-sion / Santuario de Nuestra Señora de Montesión) is a Marian shrine located near the town of Porreres in the center of the island of Majorca. The origin of the shrine dates back to the fourteenth century to the fifteenth century, the sanctuary housed a "Grammar School". 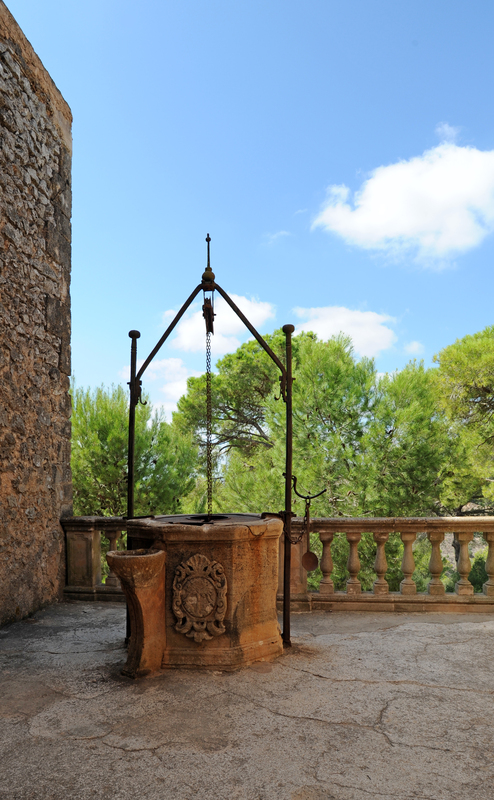 The shrine to the Virgin of Monti-sion is at the top of Puig de Monti-sion, located inland in the central southern part of Mallorca. Puig de Montesión is in the Serra de sa Mesquida is the chain of mountains of easternmost massif of Randa. Puig de Monti-sion is a low-lying hill, rising to 248 m, but with a wide circular base, which rises majestically above a cultivated plain. The hill slopes are covered with pine, carob and wild olive trees. The Sanctuary of Monti-sion is roughly halfway between the sanctuary of Cura in Algaida and the Sanctuary of Sant Salvador in Felanitx. To reach the sanctuary of Monti-sion from Palma, head of Llucmajor, then head Campos, and turn left on the road Ma-5040 to Porreres, the small road that goes to the sanctuary through the woods, taking on the left 3 km before Porreres. From the fourteenth century there was the summit of the Mount of Monti-sion dedicated to Our Lady of Mount Zion (Mare de Déu de Monti-sion) hermitage. Over time the sanctuary was enlarged and at the end of the fifteenth century, from 1498, the chapel that we see today, and the monastery began to be built. The eighteenth and nineteenth centuries, the entire sanctuary undergoes transformations. In 1858, following the policy of confiscation (desamortització), the sanctuary and the 53 acres of surrounding land were confiscated by the state. From 1887 to 1893, the future bishop of Palma, Pere Joan Campins i Barceló (Palma, 1859-1915) was the pastor of Porreres. 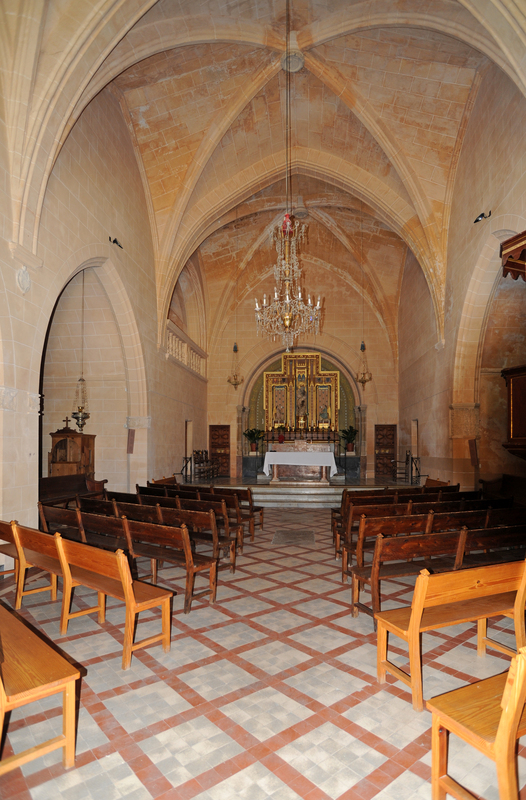 During the six years he will spend in Porreres, Pere Campins undertook a major restoration of the sanctuary of Monti-sion, in 1892, a new altar was built in the chapel. Pere Campins was bishop of Palma from 1898 until his death in 1915. 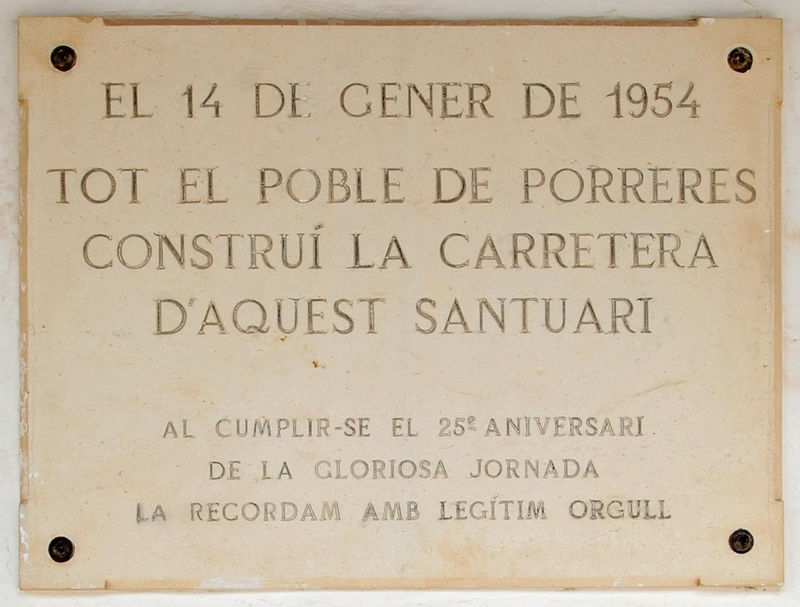 The main avenue of the city Porreres bears his name in his honor (Avingida del Bisbe Campins). The current appearance of the sanctuary date of restoration of 1892. Access to the sanctuary Montesión a surface road that was once a dirt road through tanks for agricultural fields in the field of Son Gardana. 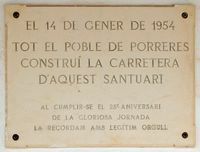 But on January 14, 1954, almost all the inhabitants of Porreres worked to open in one day the course of three km winding road that now allows access to the sanctuary automobile. On each side of the road were seven pairs of Gothic columns, built in the fifteenth and sixteenth centuries, symbolizing the Seven Sorrows and the Seven Joys of Mary, only five have been preserved, but in poor condition. These octagonal columns, sandstone Mallorca (marès), are surmounted by an octagonal tent and a medallion depicting a joy or pain of the Virgin. The roadside there are also small crosses a Way of the Cross (Via Crucis), the eighteenth century, which ends at the sanctuary. 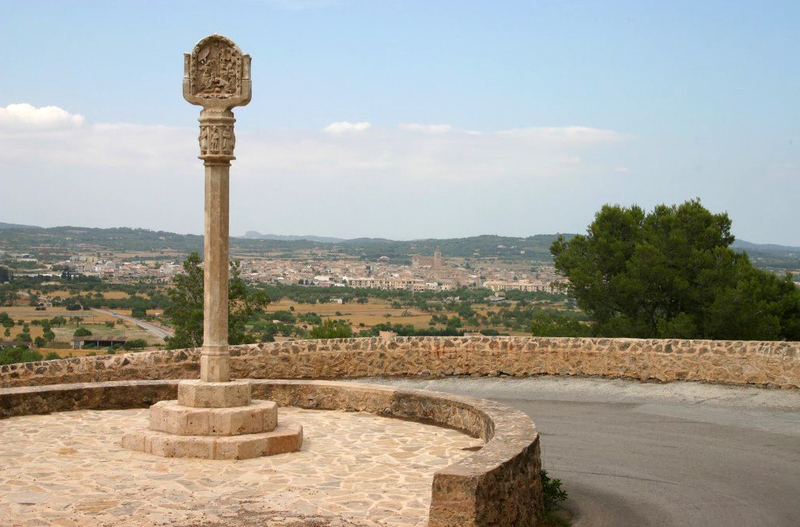 After climbing through the woods, the road comes to a terrace on the south-east of the sanctuary this terrace offers spectacular views of Manacor, we guess the far north-east of Felanitx southeast - there including the Sanctuary of Sant Salvador and Castle of Santueri - and Santanyí and Campos south. From the terrace a wide staircase leads to the entrance of the sanctuary door. 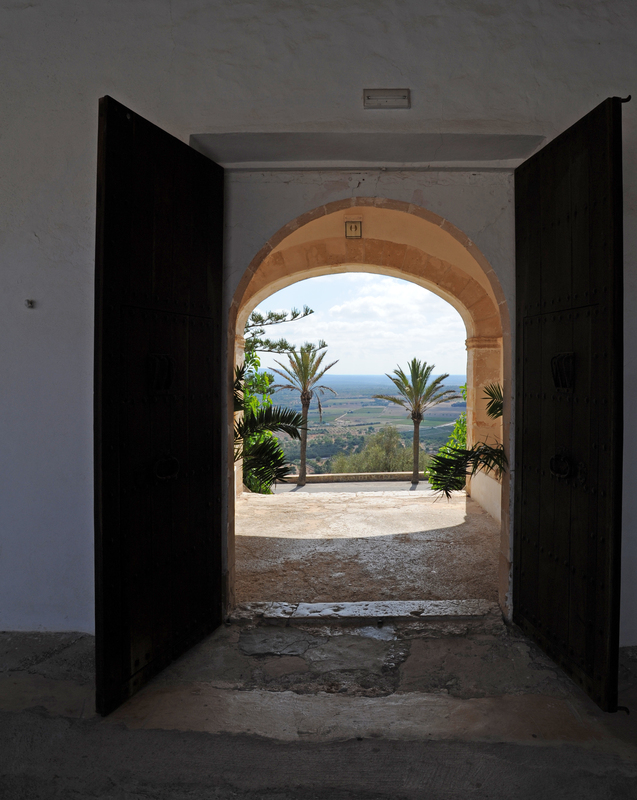 This door with segmental arch opens onto a porch, covered with a barrel vault, which gives access to the gallery of the cloister by a semicircular door, above the second door is a niche with a statue of Our Lady of Monti-sion. The chapel sanctuary Montesión is located on the northeast side of the irregular pentagon formed by the cloister. This chapel - which replaced an older chapel dating from the fourteenth century - was built from 1498, along with the cloister. It was built under the patronage of two important families of Porreres and entrusted to the protection of Our Lady of Mount Zion. The front of the chapel has a door lintel and in the upper part, a rose and three stone arches, the top of the facade is a bell wall. The interior has a single nave with two sections and a raised heart three steps and two chapels on each side. Each section of nave is covered by a ceiling vault supported on consoles, the two sections are separated by pointed arches. A neo-Gothic altar, part of a round arch above the altar, contains the image of the Virgin of Monti-sion, it is a Majorcan marble statue dating from the late fifteenth century or early sixteenth century. Mare de Déu de Monti-sion carries the Child Jesus on her left side - unlike the usual - and a bird in his right hand. At his feet we can see a badge, perhaps that of the wealthy family Dusai of Porreres, who was one of the two patrons families sanctuary. One of the four side chapels contains an altarpiece of the eighteenth century representing Saints Cosmas, patron of surgeons, and his brother Damien, patron of pharmacists saints are painted in Arabic costume inspiration, as befits their origins, and accompanied instruments beheading (the saints Cosmas and Damian were beheaded during the anti-Christian persecutions of Diocletian). This altarpiece was offered by the brotherhood of barbers, surgeons precursors. On the left is the sacristy which keeps another Mother of God (XV-XVI century), attributed to Gabriel Móger and votive offerings or promises to the Virgin Mary. 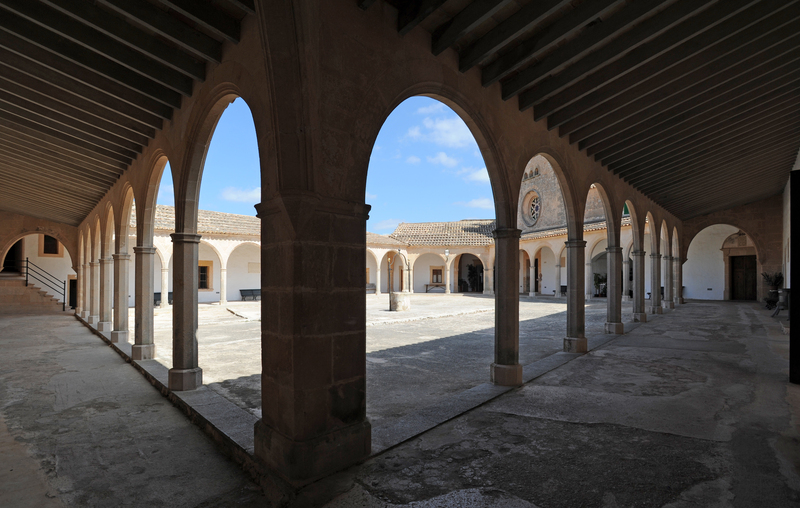 The cloister of the sanctuary Montesión has the distinction of being a single irregular pentagonal shape Mallorca ; arches arches are semicircular. In the center of the patio is a well hexagonal rim and porch with wrought iron that allowed wells to tap rainwater collected in a cistern. Another well is located on the southwest side of the sanctuary, near the entrance. In 1530, a Latin Grammar School was founded in the sanctuary of Monti-sion to prepare students for admission to the University of Llull Palma, the Estudi General Lullia, in line with the Grammar School founded in 1502 the sanctuary of Cura to Randa. The College of Monti-sion was one of the three most important rural Majorca, between 1664 and 1670, there were a hundred students. In 1694 was built a large study room, this "Living Grammar" is located on the northwest side of the cloister. 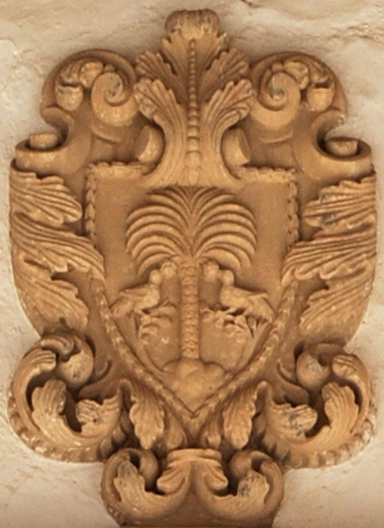 The entrance to the hall is a door lintel above the lintel are the arms of Porreres (a palm tree with two swallows), and on the sides, a bas-relief carved on the left of an inkwell at right of a notebook, with the Latin inscription: "Dilicit Diis portas Sion dil. Diis portas studiosorum". The classroom is a large rectangular nave which could accommodate one hundred students and is covered with a barrel vault with three arches supported on smooth pilasters, and stone benches attached to the walls. On the roof of the room Grammar is a sundial. On the evening of November 25 was celebrated the feast of St. Catherine, the patron saint of students: the night was lit a huge bonfire, which met another fire ignited by students of the Cura sanctuary. The school reached its zenith in the seventeenth century, it was closed in 1835 under the anticlerical government Mendizábal and policies confiscation of the Catholic Church ("desamortización", disamortization). On the right of the church, and left the porch entrance, the kitchen, the refectory and the dormitory students retains its three sections ceiling vault. According to Arxiduc, Archduke Luis Salvador of Austria, in his book "Die Balearen"
"There are twelve rooms for students, separated by partitions, and a small kitchen, a bathroom and a closet, above the room, there is a space to store the wood up to eight students sleeping in each room. The remaining units are used for teachers and servants, with a total of twenty rooms. " At the "Sunday of the Angel" (Diumenge del Angel / Domingo del Ángel), which is the first Sunday after Easter, the celebration takes place the Pancaritat with a procession from the town of Porreres to sanctuary Monti-sion, after a Mass held traditional dances in the cloister. 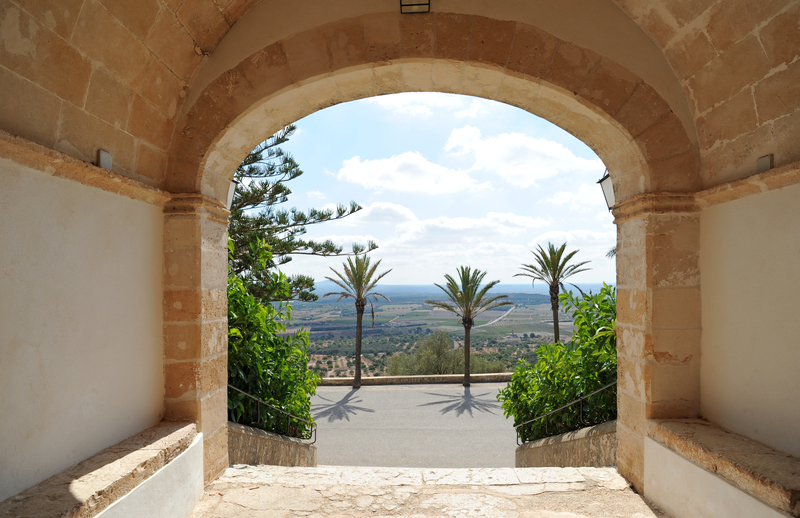 The Sanctuary of Monti-sion has a small inn with a few rooms for pilgrims and tourists, and a restaurant Majorcan cuisine.